This paper aims to offer an ideas on one of the problems of national education including Islamic education, in the form of low student achievement, as well as the phenomenon of teacher in a mechanistic curriculum, through motivation theory of Maslow and David McClelland. The approach used is a qualitative approach by conducting library searches and literature’s which are relevant to the subject. The analysis used discourse analysis and cultural analysis related to the reality of education that occurred in Indonesia. Through this paper, the authors offer an idea of the need to instill motivation to learners, either by fulfilling basic needs as Maslow's theory, or by increasing the achievement motivation (nAch) as McClelland's theory, in breaking down national education problems. SUSANTO, Nanang Hasan; LESTARI, Cindy. Mengurai Problematika Pendidikan Islam Berbasis Teori Motivasi Abraham Maslow dan David McClelland. Edukasia Islamika: Jurnal Pendidikan Islam, [S.l. ], v. 3, n. 2, p. 176-192, apr. 2019. ISSN 2548-5822. 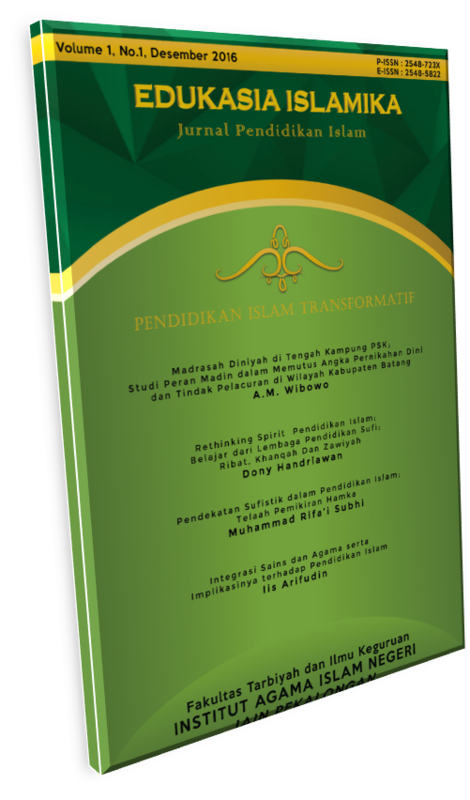 Available at: <http://e-journal.iainpekalongan.ac.id/index.php/edukasiaislamika/article/view/1598>. Date accessed: 21 apr. 2019. doi: https://doi.org/10.28918/jei.v3i2.1598.